Supporting digestion, feed intake, feed conversion and weight gain especially in periods of increased stress such as enteritis. 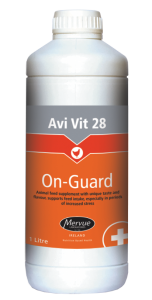 Avi Vit 28 On-Guard is a unique concentrated formulation based on a blend of essential oils and amino acids developed by Mervue Laboratories in Ireland and intended for use in animal production for increasing and supporting performance. 200ml is added to 1,000 litres of water. Feed for 3 days at times of stress.